Mechanical activation of solid substances is one of the component of the modern scientific discipline of mechanochemistry. At present, mechanochemistry appears to be a science with a sound theoretical foundation which exhibits a wide range of potential application. Amongst the commercially operating processes: modification of the properties of building materials, a new method of fertilizer production, activity enhancement and regeneration of catalysts, new methods of producing slow-dispensing medical drugs, control of reactions in chemical technology and preparation of advanced materials. 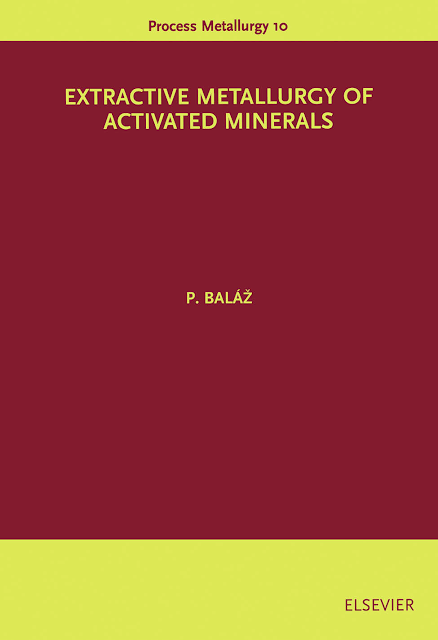 Mechanical activation is of exceptional importance in mineral dressing and extractive metallurgy and this area forms the topic of this book and is the result of more than twenty years of research and graduate teaching in the field. The first chapter deals with the history of mechanochemistry, its theories and models and describes the development of ideas in the field of mechanical activation of solids. The equipment used for mechanical activation and their working regimes are also described. The second chapter is devoted to selected modern identification methods (infrared spectroscopy, photoelectron spectroscopy, electron paramagnetic resonance, Massbauer spectroscopy and X-ray diffraction) which are commonly used for the investigation of mechanically activated solids. The principles, practical application and imitations of these techniques are presented with examples drawn from the study of minerals. 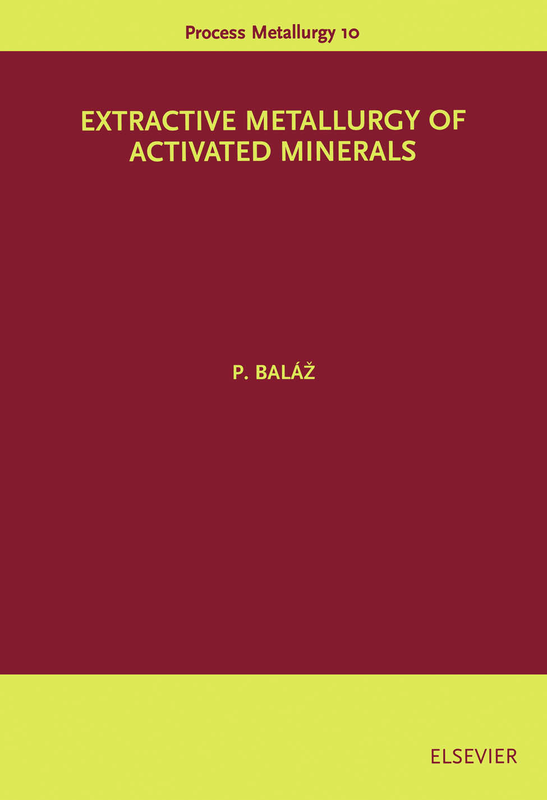 All the currently available knowledge relating to physico-chemical properties of mechanically activated minerals, i.e. particle disintegration, new surface formation, aggregation and crystal structure disordering are summarized in the third chapter. The changes in these physico-chemical properties are frequently observed to occur concomitantly, e.g. there are relationship between new surface area formation and disordering of crystal structure and between disordering and changes in the hyperfine structure of mechanically activated minerals. The first systematic papers concerned with the effect of grinding on properties of substances were published in the last century by Carey Lea. He investigated the halides of gold, silver, platinum and mercury and observed that they decomposed to halogen and metal because of trituration (fine grinding) in a mortar. According to the author, the decomposition cannot be attributed to temperature because these substances exhibit sufficient thermal stability. In these publications, it was for the first time pointed out that not only heat, light and electric energy but also mechanical energy is able to initiate chemical reactions. Flavickij and later Parker investigated the chemical reactions initiated by trituration in more detail. The method of trituration was applied later to qualitative analysis of natural mixtures in geology. Tamman investigated the effect of mechanical energy on metals. According to this author a part of this energy (5-15 %) remains accumulated in material thereby raising its thermodynamic potential. Owing to this fact a considerable increase in the rate of material dissolution occurs. In the forties, Clark and Rowan found that the grinding of solid substances could produce equal effect like high pressure or shear strain . Bowden and Tabor allege that temperatures over 700~ can be observed at the contact of solid substances exposed to friction. These high temperatures, however, last only .According to this hot-spot model, these localized temperatures significantly promote the mechanically induced reactions. In fifties, Peters investigated the influence of mechanical energy on a great number of reactions, such as synthesis and decomposition of carbonates, redox reactions, reactions connected with colour change, etc. 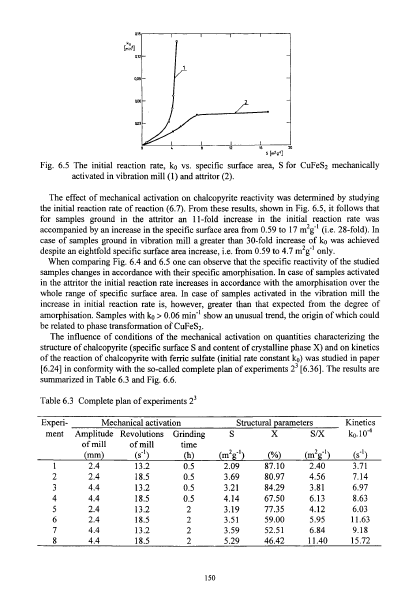 The author points out the thermodynamic point of view concerning realization of reactions. Heinicke alleges in his monograph that many reactions for which the equilibrium thermodynamics does not afford favourable conditions can be realized by the effect of mechanical energy. In some cases, the application of nonequilibrium thermodynamics seems to be serviceable. non-activated sample as well as for a sample mechanically activated for 15 min. The dependence of the degree of conversion ot on the time of thermal decomposition tT for different experiments . While we can observe that the rate of decomposition increases in the whole interval of the values of tT, although a gradual retardation of the decomposition is apparent at higher temperatures and the decomposition is limited by the degree of conversion cx = 0.8-0.9. If we compare the above figures with each other, we can see that the mechanical activation probably does not change the mechanism of decomposition and accelerates the decomposition rate only slightly. The influence of mechanical activation decreases with increasing temperature. The traditional scheme of metals extraction from minerals involves some processes of mechanical character ameliorating the accesibility of the valuable component by the leaching agent. Leaching represents the key stage in the extraction scheme and its course may be affected by selection and choice of the method leaching and/or by convenient pretreatment of the solid phase. Thermal and mechanical activation belongs among the most important pretreatment methods which influence solid phase leachability. The thermal activation of sulfidic ores aims at transforming the poorly soluble minerals into more soluble forms. That enables better selectivity in transfer of usable metal into solution, nevertheless it appears that some new problems concerning exploitation of the sulfur emissions arise. In the past three decades enhanced public awareness and governmental pressure have focussed on the problem of sulfur oxide pollution. Sulfidic minerals account for a large fraction of the sulfur oxides. The special problem of the minerals is the presence of small amounts of As, Hg, Te, Se which may be emitted together with sulfur in form of oxides by the thermal activation. The efficiency of both mineral processing and extractive metallurgy of minerals depends on the separation of individual mineral components and on the exposure of their surface. The production of flotation concentrates, with particle sizes of tens of microns, is not sufficient for many hydrometallurgical processes to operate at their optimum. As a consequence, metallurgical plants require for the effective processing high temperatures and pressures and some sort of concentrate pretreatment. Mechanical activation is an innovative procedure where an improvement in hydrometallurgical processes can be attained via a combination of new surface area and formation of crystalline defects in minerals. The lowering of reaction temperatures, the increase of rate and amount of solubility, preparation of water soluble compounds, the necessity for simpler and less expensive reactors and shorter reaction times are some of the advantages of mechanical activation. The environmental aspects of these processes are particularly attractive. 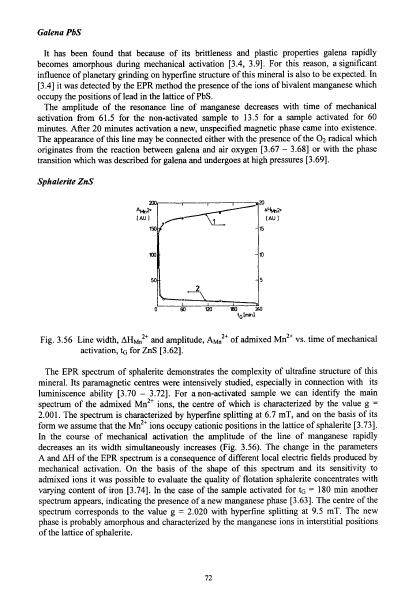 This Chapter is devoted to the examples of application of mechanical activation in the treatment of sulfidic concentrates by different technological operations like flotation, leaching and sorption. Effect of mechanical activation on the flotability of minerals : It is well known that the degree of dispersion and other physico-chemical properties of minerals are changed by mechanical stress in grinding machines. 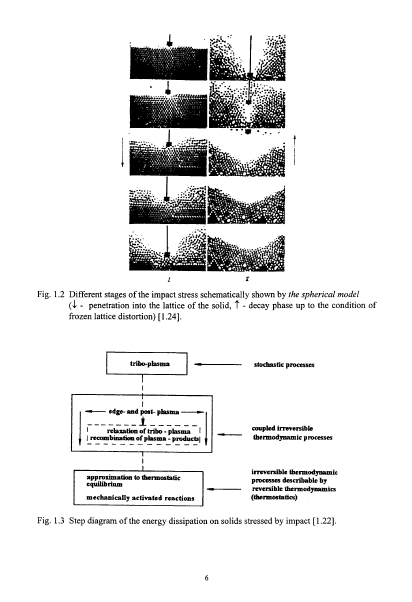 These effects not only have significance in enhancing dispersion, but also affect particle sizes typically encountered in flotation since the structural defects may be concentrated within thin surface layers. The sulfidic concentrates are ground to flotation fineness in industrial plants, as a rule, in ball mills where the grinding effect is achieved by rubbing and crushing. As vibratory mills often used for mechanical activation work by a similar regime, their application to modification of the surface properties of minerals was investigated. Plaksin and Safejev found that the adsorption capacity of galena for the collector potassium butylxanthate decreases with decreasing size of particles. This may be due to a change in electron concentration in the surface layer of PbS. The higher electron concentration in the case of finer particles makes the electron transitions between the xanthate anions and the surface of galena energetically unfavourable owing to which the formation of a solid particle-xanthate bond is hindered. However, the relationship between size of the particles and their adsorption properties is not unambiguous. In addition to the conditions of mechanical activation a number of other factors play a role and many of these factors are antagonistic. Ocepek investigated the influence of vibratory grinding on the floatability of galena and sphalerite. Experiments performed in a flotation cell showed that there is an optimum degree of mechanical activation that increases the floatability of sulfides compared with non-activated sulfides. The content of amorphous material increases with the time of mechanical activation and results in a decrease in floatability. For PbS, the decrease in floatability can be explained by formation of anglesite PbSO4. Mechanical activation of a galena concentrate involving a closed cycle with classifier has been described in which showed that greater selectivity and increased lead recovery could be achieved. Moreover, it was possible to reduce the consumption of electric energy by 17 %, the abrasion of mill lining to 68 % and the grinding flowsheet to a single stage. The increase in recovery and selectivity may be due to a considerable decrease in iron content in the pulp due to abrasion reduction and the shorter contact time of particles with aqueous phase. indicated that it is possible to influence the flotation properties of sulfidic ores by control of the electrochemical potential in the pulp during the grinding process. 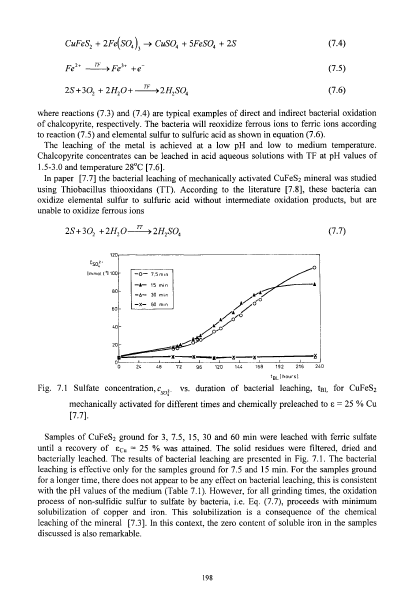 These electrochemical experiments demonstrated the possibility of raising the concentration of defects and weakening the bonds at the interface of mineral grains and was shown to work on several sulfidic concentrates.